The breaking of the 82nd seal of the Roboplastic Apocalypse is the the sound of millions of Bon Jovis and Bruce Speingsteens crying out in terror as the Nostrodomatron invades New Jersey! Yes I hit up East Coast Comic Con 2015 at the Meadowlands Exposition Center and boy did I have a blast talking to the most Robotastic lineup of Marvel comic creators I have ever seen at one convention. Listen in horror as I get Mark Texeira to sign a cover he's always wanted people to know he did while the books I asked Herb Trimpe to sign weren't so lucky. 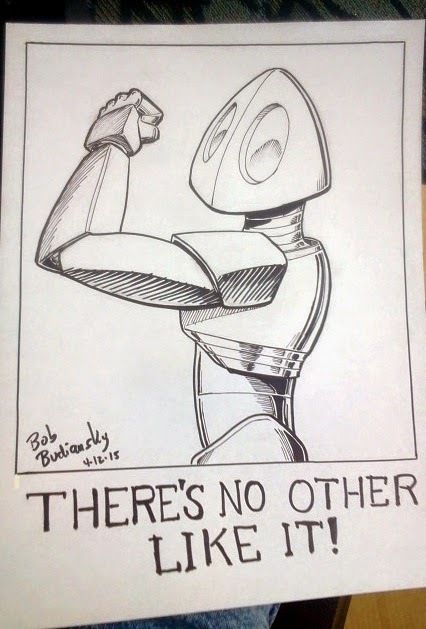 Plus I get in some titanic conversations with the TechSpectacular Bob Budiansky and Darin' Dave Hunt that shake the very foundations of our understanding of life, the universe, toy robot comics, and kangaroos wearing robotic body armor. What happens when you sing showtunes to Larry Hama? What unpublished Marvel Transformers comic art did Dave Hunt have Dwelling in the Depths of his drawings? And did Hasbro keep Bob Budiansky locked in the back and feed him raw meat? Find out all that and more in this HUNT 'N BUD & HERB WITH TEX edition of the podcastalypse! See more of my East Coast Comic Con pictures at Flickr Macrocrania. I could not have picked a better con for the final convention recorded episode of the Roboplastic Podcastalypse. It had a lineup of legendary comic creators, some of whom I was able to trick into doing a little talky talky while they signed comics and drew sketches and met with their fans. ECCC had that absolutely perfect mix of celebrity and fan interaction that I always hope to get when I go to a show. Above left you'll see someone doing a professional interview with Bob Budiansky with a camera and microphone and everything! Meanwhile, Herb Trimpe was sketching incredibly accurate likenesses of people on the backs of their shirts! Legendary professional fan Fred Hembeck was destroying the Marvel Universe way before Ultron made it cool. He brought a binder full of sketch cards that was worth the price of admission to just look through. He gave me the lowdown on why his ROM sketches are so tough to get even though he's constantly eBaying them all the time. I finally got Larry Hama to sign my Bucky O'Hare Christmas cards and I got to prove to him that I, too, had time to see plays. Massive thanks to the Real Life Peter Griffin for helping me with the outro to this episode. My favorite dealer of the show award went to the RetroArtBlog.com. They had tons of stuff from the late 70s that blew me away like Micronaut Colorforms, Starbirds galore, metal lunchboxes up the wazoo, and even the super rare Godzilla tabletop game, which they demonstrated to a guy wearing a helmet made of plush puppies. They were even selling the control art for the Shogun Warrior Colorforms background and a crazy Japanese Super Robot Projector set that I'd never seen before in my life. If there's a thirty year old Colorforms set or ViewMaster reel you need, put on your bell bottoms, load up some Bee Gees in the 8 track player of your custom van and go hit them up. Mark Texeira was an absolute firecracker as he always is and he finally settled the question of who penciled the cover to Transformers #3. He also settled the question of what he's doing now by telling me about his Law of Resistance book with PKMM Entertainment, his A Hero's Death Kickstarter project, the recent Ghost Rider cover he did, and his upcoming appearances at Big Wow ComicFest April 17-8, Motor City Comic Con in May, and HeroesCon in June! THE BEST LOUSY SKETCHER EVER! It is always a pleasure catching up with my favorite lousy sketcher, Papercutz Editor-In-Chief Mr. Jim Salicrup. I bought a couple lousy sketches and although I didn't record it, we talked about Transformers and Visionaries and that time I interviewed him back at Miami Book Fair 2010. (Well maybe not that last one.) He signed my Transformers #4 and Visionaries #1 (which he wrote) and I asked him if he knew anything about The Night the Transformers Saved Christmas but he didn't know they did. I let him know how awesome those Papercutz Lego Ninjago books sold at my kid's first grade book fairs and I told him he really needs to come down to Florida more often so he can tell us some of his ol' Spidey Super Stories . DARIN' TO TALK WITH DAVE! It was a highlight of my convention interviewing life to finally meet Darin' Dave Hunt, the man who inked the majority of Jose Delbo's pencils during their run on Transformers. Mr. Hunt brought several binders of his work to show to fans, including a couple pages of never-before-published Transformers art! He was able to talk a lot about how much work Transformers was and why there were some books that were created but never published. He also explained who that guy was on the cover to People magazine he drew in Transformers #45! Check out his lengthy ComicBookDB.com profile and hit him up on Facebook! The pages above are part of an unpublished Transformers comic from the original Marvel run, whose existence had up to this point not been widely known. Mr. Hunt didn't really understand the magnitude of importance these three pages of unpublished Transformers comics art carried with them. As the artist he didn't really know the characters or the significance of a Transformer story that never made it to print, but I made sure to explain to him what a big deal it was. He did say he thought the characters he inked over Ian Akin's pencils were a noticeable departure from the designs he was used to drawing. That would make sense since these pages were from a story that was adapted from the Transformers cartoon, featuring characters that were never used in the mainstream Budiansky/Furman books. He told me he wished he knew more about Transformers so that he could have understood these things, but I told him he didn't have to know anything about them-he LIVED them for a good many years! He agreed with me and said he may not know much about the mythos, but boy could he draw the heck out of 'em. The Allspark-Unpublished Marvel G1 comic art for an adaptation of "The Dweller in the Depths"
TFArchive-"Lost" Marvel Issue Art Discovered. THERE'S NO OTHER LIKE HIM! Depending on what time it was, Bob Budiansky was at his table drawing all manner of superheroes, monsters, demons and robots. And some people even came by to get sketches from him, too! Yes I finally got the chance to sit down for a good 20 minutes and talk to the man who killed Optimus Prime about all sorts of stuff from the recent revival of interest in Sleepwalker and Brute Force to that time Hasbro locked him up and fed him raw meat. Unfortunately I did not get to ask him what Leader-1's tech spec motto would be or if the cover to The Interplanetary Wrestling Championship was a metaphor for a man's quest to rid one's self of toy robot addiction, but here's hoping maybe one day down the line he'll accidentally find himself at a 7-11 in Florida where I'm buying lotto tickets, hot dogs, and Tastycake lemon pies and our magical conversation lightning will strike again. Neal Adams sang me the Bucky O'Hare song! Hello from East Coast Comic Con! That time I asked Mike Zeck about the cover to Transformers #3. The time I met Larry Hama dressed as a GoBot. Papercutz losing the Lego license. 1984 newspaper article where Hasbro admits feeding Bob raw meat. A Hot Pocket for 20 cents is a steal any day of the week. THE KING OF ALL MONSTERS! I never really understood why people wept when movie stars or royalty died. I get it now. Herb Trimpe was my Clint Eastwood of comics and my King Richard of robots. I loved him and his work so much that Colin and I dedicated entire episodes of the Roboplastic Podcastalypse to our disappointment at not being able to see him after last minute cancellations at conventions. And when the stars aligned and I finally did get to meet him, it was glorious. He was at East Coast Comic Con this past weekend so I made sure to stop by his table and finally get my Robotix #1 signed. I planned on buying a sketch and getting a picture with him but his Saturday commissions list was full. I asked him if he'd be back Sunday and he said yes so I figured I'd get that drawing and picture then. He never showed up Sunday and I guess I figured it wasn't a big deal and we'd meet again somewhere down the road. Well I won't be getting that chance now but I will cherish forever that conversation we had in episode 73 about why Transformers weren't all that great and why Shogun Warriors were. And of course spending most of our time talking not about robot comic books but about being Air Force Weather observers during two entirely different eras. Thank you so much for keeping such a rigorous convention schedule and giving so many people the chance to meet you, but most of all, goodbye, Mr. Trimpe. Wherever you are I know those kaiju have gotta be running scared from your rocket punches! Having a blog and podcast has been an absolute blast, both because of the people I've fooled into talking to me and especially the ones I have fooled into listening to me. I also had a blast this weekend after spending a little bit of time with Mark Texeira, Dave Hunt, and Bob Budiansky. I don't know that I've ever had more fun than I did at East Coast Comic Con. I came to the realization that there's nothing I could really do to top the soon to be released show 82, plus my impending move from Florida in a few weeks is going to be a big change. Southern Florida was really the heart of the Roboplastic Podcastalypse and it will not be the same without recording here. Plus 84 is a really cool number to end a show about old toy robots on. So I just wanted to let you, my fellow Macrocranians, know that episode 84 will be the last episode of The Roboplastic Podcastalypse. 82 will be the ECCC show, 83 I would like to do a listener call in type deal and 84 will be kind of a special retrospective. I'd like to release 84 on the 4th of July so I can pretend the fireworks are for me! I have already written here a little more than I think an announcement about the end of a show with 12 listeners deserves but I figured a bit of an explanation was in order because you guys mean a lot to me.